The former chairman of Derby County football club has died from cancer at age 74. Lionel Pickering, a former journalist at the Derby Evening Telegraph and Sydney Sun, established the free title Trader group of newspapers. 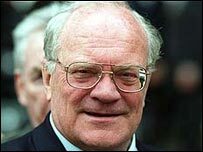 He bought the Rams in 1991 and masterminded the club's move to Pride Park before selling the club in 2003. Despite a spell in the Premiership, the club was heavily in debt when he relinquished control. Mr Pickering, who leaves three sons, was widely credited with introducing free newspapers to the UK. Peter Gadsby, current chairman of Derby County said: "Lionel was a maverick who put his money where his heart was and the fact that his chairmanship ended unhappily should not disguise the fact that he had overseen a period of huge achievement both on and off the field. "Lionel played a major part in an important stage of the club's history and we will hold a minute's silence in his memory before the next home game against Sunderland". Mr Pickering started the Derby Trader in 1966 from a bedroom at his mother's home, and delivered many of the early editions himself. Over the next 20 years the Trader Group grew across the Midlands and in 1989 he sold out to Thomson Regional Newspapers for more than £25m. He died in the Derbyshire Royal Infirmary after a long battle with cancer.